Take your website to the next level by choosing one of our high-impact professionally designed website templates. 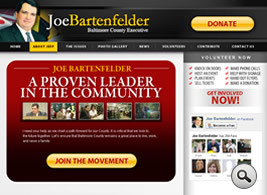 Our templates are highly customizable and appropriate for all political campaigns. Our websites are not only beautifully designed – they are driven by a high-powered backend that allows for direct integration with social networks, blogs & forums, RSS Feeds, YouTube and several other multimedia and social media networks. The engine allows the candidate to post videos, podcasts, and has an integrated ‘Events’ calendar to post important dates for site visitors. The site also allows your supporters to join the campaign's online network with a simple registration process. After joining the network, supporters can login to their account to create subgroups, communicate with other network members, join email lists, register to attend or volunteer for an event, create an event that they will host (happy hour, canvass, letter stuffing, etc. ), sign up for campaign alerts, and much more. Web Boost is sure to help your campaign coordinate and develop a winning ground strategy to ensure victory on election day!